ANNIE SHERMAN DESIGNER JEWELRY GOES HOLLYWOOD! CELEBRITY HOLLYWOOD JEWELRY FOR YOU AND MOVIE STARS! ANNIE SHERMAN DESIGNER JEWELRY GOES HOLLYWOOD! CELEBRITY HOLLYWOOD JEWELRY FOR YOU AND MOVIE STARS! 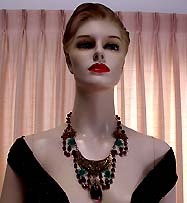 I design Vintage Antique Estate Costume Fashion Jewelry, Victorian, Art Deco, Art Nouveou Style Necklaces, Earrings, Matching Jewelry Sets Parures, Bracelets, Brooches and Pins. Please don't forget to also browse the other necklaces, earrings, jewelry matching sets parures, bracelets, brooches and pins, BRIDAL WEDDING FASHION JEWELRY. 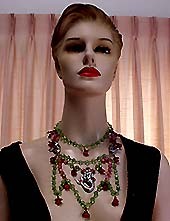 All are high quality old antique estate collectibles - bakelite, Art Deco and beautiful vintage crystal rhinestone necklaces, Juliana necklaces and fruit salad necklaces. 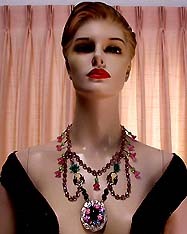 Signed vintage costume designer necklaces include Weiss, Coro, Lisner, Miriam Haskell, Hobe, Trifari, Eisenberg and more. Circa 1920 through circa 1980. Read about the history of vintage estate antique earrings, vintage jewelry glossary and Annie Sherman Designer Jewelry Goes Hollywood. Not only are these collectible jewelry, they are beautiful wedding, bridal, bridesmaid, prom, pageant jewelry and fashion jewelry for parties, cruises and special functions! Every jewelry item comes with a lovely free Oriental silk jewelry pouch! Vintage Jewelry Gift Certificate. I Buy Vintage Estate Antique Jewelry. About Jewelry Appraisals. Vintage Fashion Accessories. Bridal Honeymoon Suite Hawaii Kona! Please click on the photo to see more large photos. Item #DN168011 - Signed Annie Sherman Russian Antique Style Baroque White Faux Pearls Gold Filigree beads Crystal Bib Necklace. Featured In The Movie 'The Code'! All Vintage Materials: White Baroque Faux Pearls, Goldtone Filigree Balls, Clear Crystals and Rhinestones, Haskell baroque pearl and rhineston pendant. Size: Length: 17" including the 3 1/2" Extender. Width: 2". Pendant Drop: 4"
Large 5/8" lustrous baroque white faux pearls alternating the large 5/8" goldtone filigree balls and champaign colored glitzy flat crystals with gold seed bead spacers. Five 2" pearl and crystal spokes radiating from each side with a 4" center drop of ornate Haskell white baroque pearl and clear rhinestone pendant to complete this gorgeous Russian antique style design. SOLD. 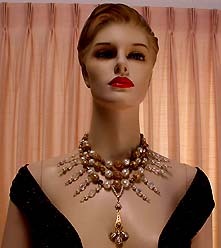 This signed Annie Sherman designer Russian antique style faux pearl crystal bib necklace was loaned to the Wardrobe and Set Decoration Departments of the movie 'The Code' for filming. It was chosen to be displayed prominently as the center piece in the movie in two gala scenes attended by jeweled guests. To learn more, please click here 'Annie Sherman Jewelry Goes Hollywood' for details. Trailer film clip from the movie 'The Code'. 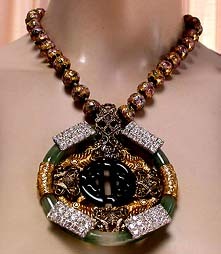 Item #DN168016 - Signed Annie Sherman Oriental Cloisonne Necklace With Large Jade Glass Pendant. 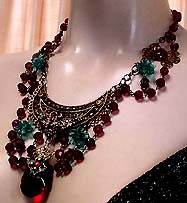 All Vintage Materials: Vintage Cloisonne, rhinestone pieces, jade glass, antique brass. Beautiful gold based cloisonne beads (1/2" each) have floral pastel pink, green and jet caps. Suspending from a large antique brass filigree bail is a large ornate Oriental pendant (3 1/4" in diameter) embellished with a center Oriental green jade motif and goldtone dragons on each side with antique brass royal court love birds layering on top. Four pronged clear rhinestone rectangular pieces to add glitz and interest. US$268.00. SOLD. This Annie Sherman designer necklace was loaned to the Wardrobe and Set Decoration Departments of the movie 'The Code' for filming. To learn more, please click here 'Annie Sherman Jewelry Goes Hollywood' for details. 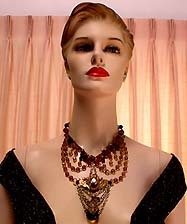 Item #DN168013 - Signed Annie Sherman Multi Color Crystal Rhinestone Bib Necklace With Antique Brass Pendant. All Vintage Antique Materials: Vintage perodot pronged oval rhinestones, clear, amber, lavender Czech glass beads, antique brass, large emerald cut amethyst rhinestone, Swarovski small round crystals. 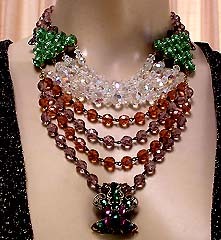 Dramatic multi colored crystal necklace has clear, amber, lavender Czech glass beaded draping strands. Vintage triangular piece on each side has large 5/8" x 3/8" peridot colored pronged rhinestones connecting two strands of lavender Czech glass beads to circle around the back of the neck. The pendant is a beautiful deep amethyst emerald cut large rhinestone 1" x 3/4" embraced in antique filigree brass with emerald green and deep amethyst Swarovski crystal accent. 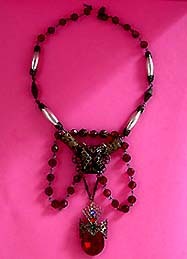 The bib including pendant is 5 1/2". US$238.00. SOLD. 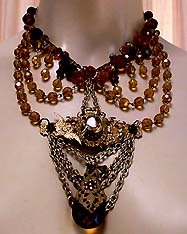 Item #DN168014 - Signed Annie Sherman Victorian Style Royal Court Amber Glass Crystal Festoon Necklace. All Vintage Antique Materials: Vintage amber Czech glass beads (two shades), goldtone chains, brass chains, Art Nouveau antique piece, amber crystal drop, small Swarovski crystals. Size: Length: 20" and adjustable. 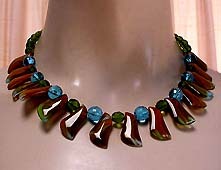 Czech amber glass beaded drapy strands forming a butterfly motif with deeper amber glass beads circling the neck base and dripping crystals for beauty. The extremely ornate Art Nouveau pendant has a large oval shaped Amber flat center stone sitting 1/2" tall and crowned pronged in an exquisite edged scalloped frame. Accompanying the stone are two Art Nouveau angels, roses, ribbons and a goddess cradling in a moon crescent, all done in antique gilt brass. Below this fantastic embellishment are goldtone draped chains with an amber teardrop crystal suspending on top of the chains and a hanging antique brass dragonfly for detail. The 2" crystal drop is wrapped in antique brass accented by a center amber crystal rosette. US$268.00. SOLD. 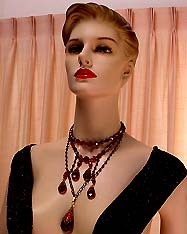 Item #DN168017 - Signed Annie Sherman Ruby Red Antique Style Drippy Crystal Necklace. 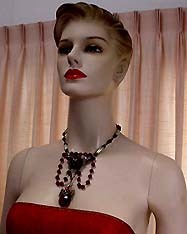 All Vintage Antique Materials: Ruby red Czech glass beads, diamond shaped antique brass beads, antique brass chains, ruby red teardrop crystals, red Swarovski small crystals. Size: Length: 16" including the 2 1/2" extender. 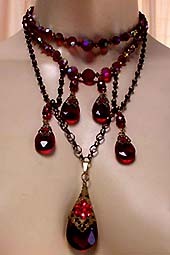 Dripping breathtakingly from the two strands of ruby red crystal beads and antique brass beads are ruby red crystal teardrops suspending from antique brass beaded chains and antique brass large rollo chains. 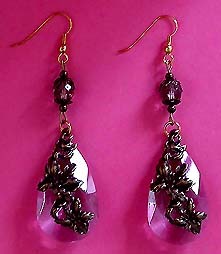 The main antique filigree brass wrapped 2" crystal teardrop is accented by a glistending Swarovski red crystal rosette. The other four teardrop red crystals (1"x 1/2" each ) are also adorned in antique filigree brass and red Swarovski crystals. US$238.00. SOLD. Item #DN168019 - Signed Annie Sherman Art Nouveau Moon Crescent Festoon Necklace With Crystal Pendant. All Vintage Antique Materials: Art Nouveau antique brass moon crescent piece, red Czech glass beads, Czech teal glass flowers, amber glass cabochons, ruby red teardrop crystal, antique brass findings. Size: Length: 19". Pendant: 2 3/8". Gorgeous Art Nouveau antique brass ornate moon crescent (3" x 2 1/2") has the layering of antique brass Art Nouveau leaves and grapes for richness. Ruby red Czech glass beaded strands draping in Festoon style loops with Czech glass teal flowers (3/4" x 3/4" each) and red crystal drops dripping within. Also, a large amber glass cabochon (5/8" x 1/2") on an antique brass butterfly setting on each side with glitzy Swarovski red crystals accenting the reflective stones. The 2" ruby red crystal teardrop pendant is embraced in an antique brass filigree mount and embellished with emerald green and ruby red small round Swarovski crystals. US$238.00. SOLD. Item #DN168003 - Signed Annie Sherman Victorian Style Ruby Red Czech Glass White Deco Glass Pearl Antique Brass Festoon Necklace. All Vintage Antique Materials: Vintage red Czech glass beads, white glass Deco long pearls, antique brass bicone fluted Deco beads, antique brass filigree round beads, large emerald cut Amethyst rhinestone and large red teardrop crystal, antique brass findings. The Art Deco white glass long pearls are from the 20's. These rare pearls really set this beautiful Victorian inspired necklace apart from most of the Victorian festoon necklaces I have seen. 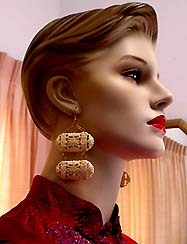 They bring out a rich contrast of red and pearl luster and add style and elegance to the piece. The gorgeous eye-catching center festoon butterfly drop (3" x 5") has a large (1" x 3/4") emerald cut Amethyst colored vintage rhinestone wrapped in open work antique brass to set on a filigree antique brass scalloped base. The large (1 1/2") ruby red teardrop crystal hanging below is embellished with a filigree brass crown motif and glistening blue, red, green Swarovski crystals lending for a breathtaking royal jeweled effect. This magnificent Victorian festoon necklace closes with an antique brass fluted barrel insert clasp to complete the graceful design. US$218.00. SOLD. 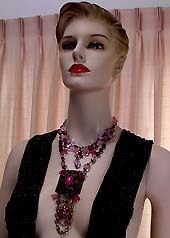 Item #DN168018 - Signed Annie Sherman Pink Glass Beaded Crystal Antique Brass Drapy Antique Style Necklace. All Vintage Antique Materials: Czech glass pink beads and flower bells, large pink crystal beads, antique brass filigree pendant, Art Nouveau antique brass pieces, antique brass dragonfly, blush pink teardrop crystal, cloisonne pink beads and antique brass flower caps. Size: Length: 19" and adjustable. Exquisite Czeh glass pink beads, flower bells and pink faceted round glitzy crystals dripping around the neck base from which a large domed antique brass filigree pendant is hung. This gorgeous filigree pendant has a large oval pink lustrous cabochon framed by Art Nouveau antique brass embellishments and glass flower bells on four corners to highlight its beauty. It then further suspend a blush pink teardrop crystal hanging in a lavender glass beaded loop. A center glistening pink crystal rosette accenting the teardrop crystal and edged antique brass dragonfly for detail. US$238.00. Item #DN168012 - Signed Annie Sherman Oriental Cloisonne Necklace With Goldtone Filigree Antique Pendant. All Vintage Antique Materials: Vintage Cloisonne beads and butterflies, antique brass bail, goldtone filigree antique pendant, white faux pearls, antique brass caps. Beautiful red based cloisonne barrel shaped beads (1/2" x 3/8" each) have pink and white cherry blossoms and the outline of gold clouds in Chinese art form. They are individually hand knoted alternating the gold bead spacers. A large antique brass filigree bail suspends a beautiful Oriental gold filigree pendant that has two sections linked by colorful cloisonne balls! Pearl accent red and blue Cloisonne butterflies perched on the ornate gold filigree scrolls. 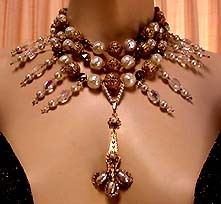 Then dangling 3 lustrous white faux pearls capped in antique filigree brass to complete this exquisite Oriental necklace. US$238.00. SOLD. Item #DN168015 - Signed Annie Sherman Victorian Style Water Lily Flower Cameo Bib Necklace. All Vintage Antique Materials: Czech glass pink bells and teal flowers, Czech glass beads, red glass seed beads and jet bugle beads, resin based cameos, sterling silver frames, porcelain roses, silver pendant with jet cabochon, large blue and pink rhinestones, enamelled butterfly and flower. The focal point is the gorgeous, eye-catching, silver edged exquisite pendant (3" x 2"). The large center lustrous jet cabochon (1" x 3/4") set in an ornately edged antique silver wide scalloped frame is surrounded by sparkling sky blue and fushia pronged large rhinestones, feminine pink porcelain roses and enamelled pink butterfly and flower. The pendant hangs prominently from the lavender glass beaded Festoon loops with gorgeous pink glass water lily flower bells, teal glass flowers for beauty and femininity. Victoria style cameos in sterling silver frames to further accentuate the feeling of antiquity. US$238.00. 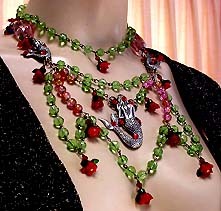 Item #DN168005 - Signed Annie Sherman Oriental Cloisonne Beaded Necklace With Dragon Pendant. All Vintage Materials: Vintage Oriental Cloisonne 12mm Beads, textured goldtone blue turcoise dragon 3 1/2" pendant. The lustrous Oriental vintage cloisonne beads (12mm) have beautiful gold trimmed flowers and leaves of pastel pink, blue and green and gold clouds depicted in Oriental art form constrasting beautifully against the jet glazed surface. Textured goldtone artistic spiral dragon with blue turquoise stones dotting the eyes and tail. This 3 1/2" pendant is not removable but who in the world would want to remove such a gorgeously exotic pendant!? This estate inspired regal Oriental necklace closes with an ornately edged goldtone insert clasp. US$268.00. SOLD. Item #DN168020 - Signed Annie Sherman Antique Silver Mermaid Crystal Victorian Style Festoon Bib Necklace. All Vintage Antique Materials: Czech perodot glass beads, red glass roses, pink/amber glass beads, jet glass seed beads, large blush pink crystal nuggets, 3 antique silver mermaids and Swarovski red crystals. Note the beautiful red glass roses are arranged geometrically in a triangular manner. Center bib lays a lovely antique silver mermaid (2" x 1 3/4") on an antique brass filigree base with red Swarovski glistening crystals for red twinkles. Two more smaller sized mermaids (1 1/2" x 1") adorning each side. Also large blush pink crystal nuggets (1" x 7/8" x 5/8" each) to further eccentuate richness and color contrast. US$238.00. 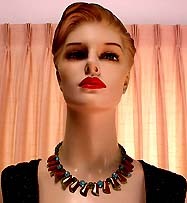 Item #DN168022 - Signed Annie Sherman Multi Color Czech Glass Beaded Necklace With Tassel. All Vintage Materials: Czech glass beads, white faux pearls, goldtone rollo chains, antique brass caps. 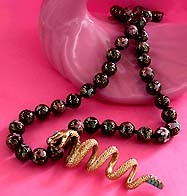 Multi Color Czech glass beaded and goldtone chain strands interwined to create gorgeous noticeable volume. Done in 6 sections with a large 5/8" lustrous white faux pearl as spacer. The 3" tassel has a large white faux pearl and five Czeh glass beaded multi color strands with each strand tipping an antique brass capped white faux pearl. The middle length extending four draping goldtone soft strands to further enhance style and interest. Reminiscent of the 60's tassel jewelry with a modernistic flair. US$218.00. SOLD. 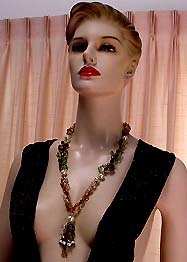 Item #DN168021 - Signed Annie Sherman Art Deco Style Crystal Beaded Art Glass Fringe Necklace. All Vintage Materials: Crystal beads, Art Glass. Size: Length: 19" including the 2 1/4" extender. Gorgeous color contrast of shimmering blue and olive green crystal beads alternating the lustrous art glass panels that have an artist splash of amber, green and blue. Note that the panels are rotatable to allow the middle pieces pointing upward for a different stylish unique look. Please see large photos. 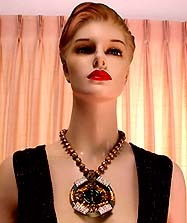 A great Art Deco style necklace for the Fall. US$168.00. SOLD. 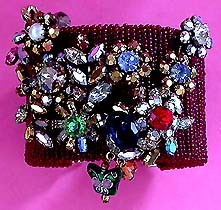 Item #DBR168004 - Signed Annie Sherman Ruby Red Glass Seed Beaded Cuff Bracelet Multicolor Rhinestones. All Vintage Materials: Vintage red glass seed beaded cuff, multicolor pronged rhinestones, cloisonne butterflies, Czech glass crystal beads and glass seed beads. Size: Cuff bracelet to fit adult wrist. Width: 1 7/8". Step into a garden of full blooms wearing this exquisitely jeweled bracelet! Gorgeous rosettes and leaves done in hand pronged marquise, baguette, round and oval sparkling rhinestones. Delightful cloisonne visiting butterflies and dangling Czech amber glass beads to further add colors and alluring movement. Big bold jewelry with a feminine touch! US$238.00. SOLD. This Annie Sherman designer hracelet was loaned to the Wardrobe and Set Decoration Departments of the movie 'The Code' for filming. To learn more, please click here 'Annie Sherman Jewelry Goes Hollywood' for details. 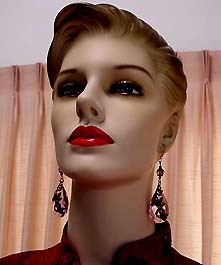 Item #DE168010 - Annie Sherman Blush Pink Crystal Antique Brass Dangle Drop Earrings. All Vintage Materials: Pink teardrop crystals, Czech glass beads, antique brass filigree caps, seed beads and embellishment, gold filled ear wires. Size: Length: 3 3/8" measuring from the top of ear wire. The beautiful blush pink teardrop crystals have antique brass Art Nouveau leaves layering over them to project an antiquity of the Nouveau era. This antiquity flair is further enhanced by the Czeh glass antique brass filigree capped beads and brass seed beads. Each earring weighs only 0.5 oz, comfortable to wear. US$128.00. These Annie Sherman designer earrings were loaned to the Wardrobe and Set Decoration Departments of the movie 'The Code' for filming. To learn more, please click here 'Annie Sherman Jewelry Goes Hollywood' for details. 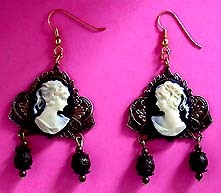 Item #DE168009 - Annie Sherman Art Nouveau Style Cameo Antique Gilt Brass Dangle Earrings. All VintageMaterials: Antique Gilt brass frame, antique brass filigree beads and seed beads, cameos, gold filled earwires. Size: Length: 3" measuring from the top of ear wires. Detailed Victorian lady in faux ivory on a jet base. The gorgeous Art Nouveau ornate triangular shaped frames are done in antique gilt brass and have intricate details of exquisite Art Nouveau motif. Then suspend two antique brass filigree round beads with filigree caps and brass seed beads. Comfortable to wear and light weight to afford alluring sways at the slightest toss. US$98.00. 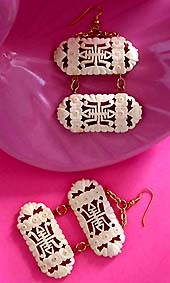 Item #DE168008 - Annie Sherman Oriental Faux Ivory Vintage Celluloid Dangle Earrings. 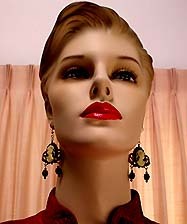 All Vintage Materials: Vintage Celluloid Oriental carved pieces, goldtone chain and gold filled earwires. Size: Length: 3 1/4" measuring from the top of ear wire. Width: 2". The goldtone chains done in a triangular fashion are suspending two ornately carved rare celluloid vintage pieces. The exotic Oriental motif carving of the slightly dome pieces are lending a rich elegance, sophistication and uniqueness. Though bold and showy, these graceful Oriental earrings are light weight and comfortable to wear. US$128.00.